1.1 The competition will be conducted under the authority of MALAYSIA B.A.S.E. ASSOSIATION. 1.2 Malaysia B.A.S.E. Association follows the guidelines of the Local competition rules. 1.3 All participants accept these rules as binding by registering in the competition. 2.1 To determine Gua Damai B.A.S.E. Accuracy Challenge 2009 champion in landing accuracy. 3.1 Title of the competition: GUA DAMAI B.A.S.E. ACCURACY CHALLENGE 2009.
i) The competition will take place from 15-16 August 2009.
ii)The venue will be at Gua Damai ,Kg. 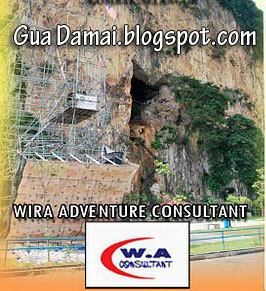 Wira Damai ,Batu Caves. 3.3 Fees: RM30 per pax. There will be a judges conference on 14 august 2009.
i) The scores for the 3 rounds will be taken. ii) Minimum number of rounds is 2.
iii) Semi-final and final rounds will be held if weather and time permits. 3.7 Wind speed scoring limit for the event is 8 meters per second. i) Official orientation jumps will be on the 15/08/09, morning. 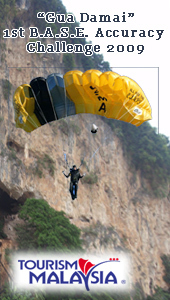 ii) Technical briefing and safety briefing will be held before the morningjump on the 15/08/09. iii) The competition will end at or before 1830 hrs 16/08/09. A fee of RM100 must be accompanied each protest. Awards will be made to the first 10 jumpers that have the highest placing. The panel of judges will comprise of national judges. Chairman of the jury –En Mustapha Al Bakri .He will select 3 personal approved by Chief Judge and Meet Director. The order of jumping will be determine by drawing lot. Landing will be scored on a 5 meters radius circle. Point of contact with the ground will be measured .Stand up bonus is high to encourage jumpers to attempt soft landings rather than just hit the target centre. This will minimize the occurrence of landing injuries.Each landing will be awarded a maximum of 16 points. 0.0 (dead center) : 10 points. 5 meters : 0 points. Each meter away from the target center looses 2 points calculate to the nearest meter.